In 2000, the United States presidential election in New Jersey, along with every U.S. state and Washington, D.C., took place on November 7, 2000. It was the 54th U.S. presidential election. The major party candidates were Democratic Vice President Al Gore of the incumbent administration and Republican Governor of Texas George W. Bush, son of the 41st U.S. president, George H. W. Bush. Owing to the indirect system of voting used in U.S. presidential elections, George W. Bush narrowly defeated Gore in Electoral College votes despite that Gore earned a higher percentage of the popular vote. Green Party candidate Ralph Nader, the only third-party candidate represented on most states' ballots, came in a distant third. Although New Jersey had voted for Democrat Bill Clinton in the past two elections (1992 and 1996), it was considered a potential swing state in 2000 because pre-election polling data showed it to be a close race. 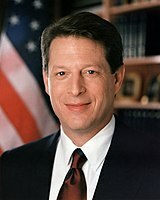 Al Gore won 56% of NJ's popular vote, beating out George W. Bush by over a 16% margin, which guaranteed NJ's 15 slots in the Electoral College to the Democratic Party. Gore won 11 of NJ's 13 congressional districts, with the biggest margins of victory in Essex County and Hudson County where he won over 70% of the vote. Bush won seven counties with his biggest margins being just over 56% in Hunterdon County and Sussex County. Nader got over 4% of the vote in counties in the northwest of the state, while taking 3% statewide. This was also the first presidential election since 1976, in which New Jersey would back the losing candidate as well. As of the 2016 presidential election[update], this is the last election in which Monmouth County voted for the Democratic candidate. Technically the voters of NJ cast their ballots for electors: representatives to the Electoral College. NJ is allocated 15 electors because it has 13 congressional districts and 2 senators. All candidates who appear on the ballot or qualify to receive write-in votes must submit a list of 15 electors, who pledge to vote for their candidate and his or her running mate. Whoever wins the majority of votes in the state is awarded all 15 electoral votes. Their chosen electors then vote for president and vice president. Although electors are pledged to their candidate and running mate, they are not obligated to vote for them. An elector who votes for someone other than his or her candidate is known as a faithless elector. 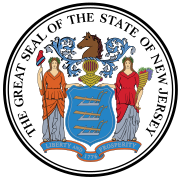 ^ "New Jersey Elected Officials Lookup". 270toWin.com. Retrieved December 1, 2016.